EcoTransit recently produced a video attacking the government’s plans for the Northwest Rail Link (NWRL). It’s a well produced video that provides some good background and makes some good points. But it’s also a bit off the mark in some instances, which are discussed below, following the video itself. The video makes two main arguments about the NWRL: that it should be double deck and that it should be publicly operated. The video gives some background on how metro systems developed around the world, where typically you have a long distance commuter rail system (often but not always double deck) combined with a short distance metro rail system primarily within a roughly 10km radius of the CBD. Commuters from the suburbs would catch a commuter rail train into a central station, where they would change for a metro train to travel within the CBD itself. Residents of the inner city could catch a metro train directly. Commuter rail is designed around peak hour travel, and off peak will often only have hourly services, while metro rail is all day and frequent. The beauty of Sydney’s system, the video correctly points out, is that rather than having 2 separate systems, it combined the two. And so Cityrail trains from the suburbs arrive at Central Station, but rather than terminating there, they continue through an underground CBD subway. This has many advantages, primarily allowing a seamless journey into the CBD, and avoids the need for large amounts of scarce CBD space that would be required for a commuter rail to metro rail interchange. But it also has its disadvantages, such as infrequent trains outside of peak hour and unreliable services during peak hour, which the video does not address. The video also criticises the previous Labor government’s various metro proposals, the Northwest Metro (which would travel under Victoria Road) and the CBD Metro (a shortened version of the previous proposal). The problem with these metros is that they seemed to be designed as a way of building metros almost for the sake of building metros. They were the wrong solution for Sydney, not because they were metros but because they were the wrong metros. Luckily, they were eventually dumped, but not before the government spent $500m on the project. Single deck metro systems are designed for short distances to dense city centers with stations spaced about 1km apart. The Northwest Rail Link does none of these, and is inappropriate for a metro system. A metro would definitely be inappropriate for making a long distance trip to a single employment center, these are trips where passengers get on at suburban stations and then all get off when they reach the CBD. While most of Sydney is low density suburbia, the NWRL alignment is a dense corridor very similar in nature to the CBD. It is full of employment and residential centers, resulting in a constant turnover of passengers both getting on and getting off at many stations along the way. Single deck trains, which lack the bottlenecks that double deck trains’ stairs have, ensure that dwell times will remain low at these stations. In fact, the proposed NWRL’s 47km alignment from Cudegong Rd to the city, which passes through the “global economic arc” of Macquarie Park, Chatswood, St Leonards, North Sydney, and the CBD, is probably the only possible long distance (significantly over 10km-20km) rail line in the Sydney basin that suits metro style operations. Cityrail doesn’t need to convert to metro to increase the existing frequency from 20 trains per hour to 30 trains per hour. RER has 2 minute headways with double deck trains, so Sydney could get higher frequencies without shifting to single deck. Comparing the headways of Parisian double deck trains to those of Sydney single deck trains is comparing apples with oranges. Paris has a far more advanced signalling system that allows trains to safely run closer to each other. The point is that single deck trains will, all else equal, always be able to run more frequently than double deck trains. This is due to single deck trains having shorter dwell times from quicker boarding/exits by passengers. You need no more evidence of this than to see that while Paris’ RER system has 120 second headways, the Paris metro’s headways are even shorter at 85 seconds. NOTE: Dwell times are important, as long dwell times lead to delays. These delays then limit the number of trains that can pass through a given station each hour. Once you limit the number of trains per hour, you are reducing the overall passenger capacity of that line. It is not uncommon for 17 Northbound trains to cross the Harbour Bridge during the busiest hour in the morning when 19 are actually timetabled. So ensuring low dwell times can actually increase passenger capacity. Paris is replacing its single deck trains with double deck trains. Having converted all Cityrail trains to double deck, going back to single deck would be a step backwards. This is true of the RER system, which is their commuter rail network, and something that Sydney did many decades ago. But they are not converting their metro system to double deck. A metro needs to be able to handle high passenger turnover, and this is the achiles heel of the double deck train. They provide lots of seats for a comfortable long distance journey, but they do this at the expense of allowing high numbers of passengers to get on and off quickly. Double deck trains have 50% more floor space, meaning 50% more capacity. The former is true, and the latter is also true if the configuration of seating is the same. However, it is not. Single deck trains will have fewer seats, allowing more space for standing passengers. Double deck trains cannot achieve this without a blowout in dwell times as the stairs into the vestibules are only wide enough for one person at a time. Single deck trains have no such constraint and so you are able to remove seats in order to increase capacity without longer dwell times. A metro’s lack of seating will result in passengers from the Northwest to stand if making a 40 minute journey into the CBD via the NWRL. Unlike other lines in the Cityrail network, the NWRL is not one where passengers continue to baord the train as it approaches the CBD, then spill out in the city. They will continually board and exit the trains as it passes through job rich areas like Macquarie Park or the North Shore. This constant turnover of passengers means seats will often become available during the journey. Only about half of all commuters predicted to use the NWRL are expected to be travelling to the CBD, with almost half getting off before crossing the Harbour. Additionally, those making the long journeys, say from Rouse Hill to the CBD, will be boarding an almost empty train, thus be almost guaranteed a seat the whole way (a similar mirrored scenario will exist for the return journey in the afternoon, where high passenger turnover will provide many opportunities for a seat if the train is full when it leaves the city). Large number of passenger will have to change trains at Chatswood, which could lead to many passengers getting stuck on the platforms, particularly if a CBD bound train is cancelled. This is absolutely true, and one of the biggests risks that the NWRL poses. However, the fault of this is not that the NWRL is being operated as a completely different system to the Cityrail network, but that there is only so much capacity across the Harbour. If NWRL trains were sent directly into the CBD, then it would limit the number of North Shore trains that would be able to do the same. The only real solution here is to build in more capacity. In the short term this means a quadruplication of the track between Chatswood and St Leonards, allowing NWRL trains to continue through to St Leonards, and in the long term it means building a Second Harbour Crossing. The Transport Minister, Gladys Berejiklian, promised the NWRL would be integrated with the Cityrail network and only made these changes to get the support of Infrastructure NSW Chairman, Nick Greiner, given that Mr Greiner is a big proponent of privatisation. However, it’s not clear that this was done to appease Mr Greiner. It would appear more likely that Infrastructure NSW was told that the NWRL was government policy and not negotiable, given the government’s desire to not be seen to back away from a transport infrastructure project like the previous government had with its metro proposals. Nor did the government seek Mr Greiner’s approval on other projects (other than WestConnex), as every time the Transport Plan and Infrastructure Plans disagreed, the government opted to take the advice of Transport for NSW’s report. Instead, this raises the questions over whether privatisation is inherently a bad thing. If privatisation is implemented like the Airport Line was, were a private company owns the stations and charges a station access fee, then it will not work as part of an integrated transport system. However, if it is implemented like the Sydney bus network or Sydney ferries, where the government pays private operators to run the vehicles, but the government sets and collects fares from commuters, then it can be a way of reducing costs while ensuring services are maintained at a contractually set level. All indications are that the latter is true in this case, particularly given that the government has seen Cityrail’s costs spiral out of control. So if introducing private operators is one way of cutting costs, then it can allow for more services with the same transport budget. Building the NWRL with smaller tunnels will forever shut out the rest of the Cityrail network from using those tracks as well as a future Second Harbour Crossing. This is unfortunate. It does not even seem that the savings from smaller tunnels will result in a significant cost saving either. In fact, the cost savings will be less than the additional costs that will be incurred in converting the Chatswood to Epping Line to be metro compatible. The separation of NWRL services itself will provide an added benefit of improved reliability through additional sectorisation, the line does not have to be built so as to permanently shut out all double deck trains. It is easy to criticise the NWRL given many of the decisions have been made for political rather than operational reasons. The desire to separate it from Cityrail is to weaken the role transport unions will have in running it. Rightly or wrongly the current government believes all the problems with Cityrail are down to the staff. Certainly building the tunnels so that double deck trains will not be able to use the NWRL is crazy. It means that in the future someone will have to design future double deck trains to fit into the smaller diameter tunnels! Reports indicate that the reduction will be only 400 mm. There is no reason that stairs should restrict the access to and from the decks – the trains are about 3 metres wide, and half this could be stairs from top deck with the other half stairs from the lower deck. People have commented that the dwell time at Town Hall, the most densely used station is rarely more than one minute, loading and unloading takes less and trains wait for their timetable departure – this means that 2 minute headways through the existing City Tunnels are feasible. Halving the existing signal spacing on the North Shore Line and the Bridge would enable trains to run closer together. Increasing the power of the new double deck stock would improve acceleration and/or top speed. Too much of the NWRL is to be in tunnel, far more of the route should be elevated, at far less cost, and some of the proposed elevated sections should be at ground level, only being elevated where needed to clear major roads, again reducing cost. Paris is not converting the Metro from single deck to double deck precisely because it is mostly in tunnel permitting the use of single deck stock only! I agree with Jim, and generally with Gavin Gatenby. The key to headways / dwell times / stopping patterns is that they need to be consistent. We know that Town Hall and Wynyard are the problem stations (and to a lesser extent Central). Obviously there is no point in having a dwell of 30 seconds at Waverton if Wynyard is 60 seconds. The fact that that there may be significant numbers alighting /boarding at global arc stations does not really matter as they will never reach the number of transfers TH and Wynyard (must be nearly 40,000 per hour in the am peak) and will not influence dwell times. Current two door per side double deck rolling stock is half of the problem, the other half is the signalling. Introduction of carriages with 3 wide doors per carriage like the MI09 on the Paris RER line A will significantly reduce dwell times. A standard MI09 consist on RER line A is 112 metres long. Each of the 5 carriages is just over 22m long. Total passenger capacity is 1300, with 475 seats. (An equivalent consist on the Sydney network would be made up of 7 carriages for a total length of 155m – Sydney suburban platform standard length is about 160m ). The MI09 would have the equivalent of 21 doors per side on the Cityrail network, as opposed to the current 16. MI09 carries a total of 2,600 passengers, 948 seats over 225m or 11.5 people per metre. If headways could be reduced to 2 minutes with improved signalling I believe that double decker stock will move more people per hour than single deck. I also believe the NWRL ought to continue to and through the CBD in the way that Ecotransit suggest: Quad from Chatswood to North Sydney, restore Lanes 7 and 8 of the Bridge to rail, reopen platforms 1 and 2 and Wynyard, thence to Central and so on. There you have a second harbour crossing, with the benefit of much increased capacity, delivered much more cheaply than a deep tunnel under the harbour. I would include the entire decision to build the line as one being made for political rather than operational reasons. The ALP said at one point that they are at war with either the staff or the unions. So I think it’s fair to say that a sizeable portion of the problems are with the staff. But there is also political interference. Moonetau is right re “Current two door per side double deck rolling stock is half of the problem.” Three doors would be better, but inserting an extra door in the middle of a car would be rather difficult to say the least. Better to add an extra wide door at each end of the car where there would be less of a problem, the floor is already at platform height. This would give 32 doors per 4 car set, 30 if it is not possible to fit in an extra door adjacent to the driver’s compartment. Together with improved internal stairs this should markedly reduce dwell time. However, this would be of no avail if passengers cannot get off and on the platforms easily. Additional stairways to the mezzanine level so people can get up without having to walk a long way? Remove all fittings on the platform except bench seats against the wall/stairs? (already being done.) More, and more comfortable, seats on the mezzanine, with audible announcements re next and next but one trains to persuade passengers to stay on the mezzanine till the last moment? Preferably the lower end of the stairways should be close to the connexion between the cars so as to serve the passengers exiting the wider end doors most easily. And better signalling as Moonetau and I have suggested above. A combination of these improvements should give a consistent capability of 30 trains/hour, possibly more. And No, the eastern side of the bridge should be used for trams which will be needed to sort out the Military Road and Northern Beaches routes. Far greater capacity than the buses currently un-servicing this route – and the trams could be extended a short distance in tunnel and out to join the George Street route – but that is another matter. What bothers me about running this line as a metro is that is it connecting the least densely populated suburbs of Sydney with the ‘global arc’. It is servicing semi-rural suburban areas and ignoring the most densely populated suburbs. That’s what metros should be doing; servicing high density areas and doing so quickly. How would one from Parramatta or Burwood or Mascot get to Macquarie Park easily? They can’t. A similar proportion of residents in the Hills work in Parramatta as they do in Sydney for example. Who has encountered the traffic streaming down Windsor and Old Windsor Roads? Agree Thought re density at the moment. But Kellyville and environs I think won’t be “semi-rural” for long. In fact it probably hasn’t been for 15-20 years. which discusses rolling stock, timetables and signalling. Thought the northwest hasn’t been semi-rural for many years. It is mostly medium density housing. However your comments about connections to the west are spot-on. We are still basing transport planning on getting in and out of the city when the majority of journeys are across the suburban area. Many people from the Hills area work in Parramatta to Penrith and many people who work in the Hills come from the western suburbs. They are ignored by the city centric planners. I know… :p I was being semi-facetious in describing them as semi-rural, but I’m generally worried about Sydney’s sprawl and disappointed by the attention these suburbs have gotten in planning railway transport in Sydney. They are still very low density compared to a lot of other areas, however I guess the argument is that better public transport may lead to increased residential densities (but that’s dependent on better planning and zoning) and increased densities in those areas worries me because huge populations shouldn’t be living on the outskirts of Sydney if there aren’t better transport links to major employment centres elsewhere in Sydney. I used to drive north on Windsor Road before Kellyville and Rouse Hill developed to what they are now and the traffic then was unbelievable. These days you don’t have to venture much further out of Parramatta to experience the gridlock flowing north on a weekday, along both Windsor and North Windsor Roads. That’s with the T-Ways in action. Thanks to moonetau and Jim I should say. Lots of comments. Great to see that it’s a topic that sparked a great deal of interest! Rather than responding individually here in the comments section, I’m going to try doing that in a new post shortly along with relevant portions of these comments. Paris is moving forward with their railway yet Sydney is going backwards. What is wrong with the politicians in this country. Anything to save a buck without looking at the long term growth and future of the respective cities in this country. Please ministers do not limit this city’s railway by any means. Sydney relies very heavily on its heavy rail network. I have said this before, one whole network is VITAL for this city. Agree. As I said in my earlier post, I think that the EcoTransit video is the best critique I have seen of the government’s current North West Rail Link plan and Bambul, although I respect your opinions, I think on this issue you have got it wrong. It is stretching credibility to suggest that the North West Rail Link could be operated as a “Metro” service. It is so far removed from the concept of a “Metro” type operation, that I’m amazed you could even suggest it. If you want a reality check about what is a true “Metro” system, you need look no further than The Tipping Point Institute’s Discussion Paper entitled “Improving Customer Experience – Opportunities for improving Sydney’s suburban rail service”, commissioned by the NSW Business Chamber. With overlay images of the major “Metro” systems in the world compared with the CityRail network it clearly shows how inappropriate it would be in converting some sectors, let alone adding long distance extensions such as the North West Rail Link, to “Metro” operation. It’s a pity that this report hasn’t received greater publicity – Jacob Saulwick and Andrew Clennell, where are you? On a personal level, I have travelled on the Paris Metro, the London Underground, the Hong Kong MTR, the Singapore MRT as well as the Paris RER and London Suburban systems and I think I have a good appreciation of the difference between a “Metro” and “Suburban” system. The only reason the “Metro” concept is being pushed is because it is Plan “B” after Infrastructure Australia rejected the NSW Government’s submission for funding for the original North West Rail Link proposal which was to integrate it with the CityRail network. The NSW Government played politics and acted like a spoilt child and instead of addressing the legitimate shortcomings in its submission to Infrastructure Australia, it chose to go it alone and the only way it could do that was to privatise the project and in doing so make some serious compromises on the way it was to operate. In fact, if they were smart (or if they could put aside their underlying agenda), the North West Rail Link could be fully integrated with the CityRail network with through services to the CBD, without the need to change at Chatswood and without a second harbour crossing in the short term. But that seems to have escaped them for whatever reason. Some compromises would be required for services on the North Shore and Northern Lines, but I believe that they would be acceptable. Under the “Metro” proposal for the North West Rail Link, the current services on the Northern Line from Hornsby to the CBD via the Epping to Chatswood Line would no longer be possible. That immediately frees up 4 train paths per hour direct to the Sydney CBD. With 2 free train paths per hour on the North Shore Line currently available from Chatswood to the CBD, that would make 6 train paths available. This could be increased to 8 train paths per hour in the peak, which was the frequency in the original proposal for double deck operation, if 2 of the Central Coast services were redirected to the CBD via the Northern Line and Strathfield. Gladys has publicly stated that the Government plans to increase the frequency on the North Shore Line to 24 trains per hour, with double deck trains, so they have immediately shot down their argument that there is no additional capacity into the CBD. On the Northern Line, the current services from Hornsby via the Epping to Chatswood Line would have to be redirected to the CBD via Strathfield and the Epping to CBD via Strathfield services in the peak period would have to be diverted to the Main Line tracks from Strathfield, where there is spare capacity, to Central Terminus. Now this is not as bad as it seems for Northern Line commuters (where I come from) because there are a significant number of commuters who do not travel beyond Central and those commuters between Epping and North Strathfield, which is one of the most overcrowded sectors on the CityRail network, would have the choice of a direct service through the CBD to the North Shore or a doubling of services from 4 trains per hour to 8 trains per hour to Central. A no-brainer. I also used to think that the NWRL as a metro was a bad idea, and used the Tipping Point report to back up that argument. What changed my view was to stop looking at the NWRL in such a CBD-centric way. Remember, just under half the projected NWRL commuters from the Hills (41%) will get off before trains cross the Harbour, while a third will get off before Chatwood. They are instead headed for stations on the Global Economic Arc – North Sydney, St Leonards, Chatswood, and Maquarie Park. Building and running the NWRL like this will only encourage more non-CBD employment at these locations, and that’s a good thing. These are much shorter trips, and there will be a high turnover of passengers at these stations – both getting off and getting on. Single deck trains are better suited to these types of corridors – with multiple origins and multiple destinations that have significant overlap. Double deck trains are better suited to longer distance journeys that originate in the suburbs and have a single CBD destination, which is how the bulk of the Cityrail network is (and which is, for that reason, maintaining double deck trains). Fair enough Bambul. I am slowly getting used to the NWRL as is as well. However, the tunnels being reduced in size is a significant stumbling block for me that I don’t ever think I can accept as a good decision. Seems very politically-motivated (against the unions). But hey I do realise you said this is an unfortunate decision too. It just seems that the governments needs to see how short-sighted that decision is, and that it seems many people would rather the tunnels built at double decker dimensions. I looked up your 2nd link I didn’t see it mentioned about people getting off the trains before any point. I seriously doubt that a third will get off before Chatswood. It would have to be assuming a far higher share of Macquarie Park workers using the trains than use the 619 and 651 (if that counts). And also a big increase in Norwest workers from the 618 & 628. Page 8, final paragraph on the left, next to the map. “Before Chatswood” was poorly worded, “By Chatswood” is more accurate, i.e. it includes Chatswood. My understanding is that Macquarie Park will see quite large growth in jobs, but minimal increase in parking spaces and also that NWRL trains will provide a much faster journey for most (though not all) workers headed there. Ah Ok. I think that forecast is wrong. Although the bit about 11% getting off at lower North Shore destinations could be about right so long as they meant to include North Sydney. I’m also sceptical about the validity of forecasts suggesting that close to half of commuters on the NWRL will alight before the CBD, when you consider that employment in the CBD dwarfs that on the North Shore and at Macquarie Park. It also would appear that the overwhelming majority of buses travelling down the M2 go direct to the CBD, bypassing Macquarie Park and the North Shore. They’ve even demolished the bus off-ramp from the M2 to Epping as part of the M2 upgrade. Anyway, even current signalling technology would be quite capable of handling 12 double-deck trains an hour on the NWRL (originally 8 trains an hour) and dwell times wouldn’t be an issue. It’s around 50-60 trips via M2 Oakes Rd stop to the CBD in the busiest hour, with 3 602s, 11 612s to the lower north shore + 4 619s to Macquaire Park for a total of 18 bus trips in the busiest hour. So we could see a quarter of the people get off the NWRL at these locations. Chatswood isn’t properly served by the bus network, so there’s a potential for real increase there. Perhaps North Sydney will improve too as you won’t need to sit in a bus on Epping Rd and the Pacific Highway any more. Actually, I’m surprised the comparison favours the North Shore that strongly. I’m sure the North Sydney/Milsons Point buses aren’t carrying as many people per bus as the CBD bound ones. Anyone who doesn’t believe the projections needs only to look at the facts today to see that it is already a reality. I’d say the numbers are similar for Baulkham Hills shire residents working in the CBD, Parramatta and the “Global Arc”, based on LGAs touched. The latter has to include from Macquarie to North Sydney to achieve that. I agree that the bus system fails to achieve to Chatswood – but perhaps that should be fixed! I’m quite sure that a number of people working in the Ryde LGA from Baulkham Hills LGA will not be walkable from ECRL stations – e.g. those working at Top Ryde shops. But I’m sure there are many more. Of those who are walkable, there isn’t exactly going to be a reduction in parking spaces, and if employment increases, parking can too. I’m sorry, I’m just not very positive about a rising market share for PT post NWRL. If one really wanted to improve PT market share for Baulkham Hills LGA residents, I’d have thought there would be a far higher focus on commuters to Parramatta. Let’s touch base with reality. Macquarie Park looks like a great source of customers but it would have to change radically for it to rival the CBD. Macquarie University is a great customer. The rest is very disappointing. As a pensioner excursion customer I sometimes catch the train to the Shopping Centre, but carrying away any purchases is a drag; I would probably take the car if my fare cost more especially when travelling in company. Parking: The generous carparks in Macquarie Park are still full. The Optus bus to Epping station still runs. People will not walk unless forced to do so as they are in the CBD by what amounts to non-existent parking. North Ryde station is next to a cemetery. The tunnel under the Lane Cove River was a mistake as there is no access to the other big potential customer: UTS at Lindfield. If the Hills is such a source of employees for Macquarie Park, why was the exit from the M2 to Epping demolished for lack of use and certainly long before any trains will run on the NWRL? Dwell times: The main article makes superficial comparisons with other major cities. 1. Sydney CBD covers a tiny, easily walkable (except for the traffic lights) area apparently 93% of journeys are on foot. 2. Most journeys in other cities involve a change of trains (at least once) to complete your journey. This is far less the case in Sydney which is so centralised. In Berlin, despite being bombed severely, the station platforms are far more generous than at our busiest TH and Wynyard where nearly all the changing and destination traffic occurs. Crowded platforms are part of the dwell time problem as much as “small” doors. Should the whole “solution” be designed around this issue? Since Town Hall in particular is the weakest link, can resources be put there to deal with the headway problem? That’s correct. A similar proportion of Hills residents work in the CBD (7.3%), Parramatta (6.9%), and the Global Arc (7.7%). If you include Parramatta and Westmead as one area, which is reasonable, then it actually leads with 9.9% of jobs (link to source is below). These figures are all for activity centres, not based around local government areas. If it were the latter, then it would be unreasonable to assume that public transport could service them, as you suggested. My understanding is that the government is seeking to restrict increases in parking spaces in major employment hubs to discourage commuting by car. The very small car number of car parking spaces for Barangaroo was a high profile example. Completely agree on improving public transport to Parramatta. I’d personally rather see improvements first on the Northwest T-Way, before building new infrastructure. Though it should be noted that congestion originating from the Hills focuses on the M2 (even before roadworks) much more than Windsor or Old Windsor Roads. Hi Richard. I don’t quite understand what you’re trying to say about the Epping exit on the M2. Macquarie Park bound buses exit the M2 at Macquarie Park, not at Epping, so I’m not sure how that’s relevant. Your comments seem to be addressing various issues that have not been directly discussed in the above post or in the comments that followed. Many of them are quite valid and I agree with quite a few, but to prevent this from getting too messy I’m just going to take it as a comment rather than a question. Although the proportion of Hills’ residents working in the CBD and the Global Economic Arc (specifically Macquarie Park to North Sydney) may be similar, that doesn’t necessarily translate to the same proportion travelling by public transport. Commuter trips by public transport to the CBD, Sydney wide, is around 75%, but I suggest it is far less to those business centres on the North Shore (including Macquarie Park) which are more car oriented. I grew up in the Macquarie Park area, so I have an intimate appreciation of how the area has developed. With the release of the Greenbelt and establishment of Macquarie University, the then North Ryde area developed as an Industrial/Warehouse precinct, later to be transformed in the last couple of decades to a Business Park environment, based almost entirely on car access. It was not designed around public transport usage. Macquarie Park is a widely dispersed area, unlike the more compact business centres of Chatswood, St. Leonards and North Sydney, which is not conducive to public transport usage, let alone a high capacity “metro” system. Car usage will continue to dominate in Macquarie Park, notwithstanding the building of the NWRL, and I doubt if the level of patronage on the NWRL from the North West to the Macquarie Park precinct in particular, will approach anything like that travelling through to the CBD. “Macquarie Park bound buses existing at Macquarie Park.” Was it always so? When the M2 was opened, the plan was for buses only to exit at Epping for the transport interchange there. Passengers were going to continue their journey, initially to the CBD and other stops, by rail. Epping residents were told to expect a bus every 90 seconds. It didn’t happen despite the exit ramp being there. And even with the opening of ECRL it still wasn’t used. This could have been partly because we still don’t have integrated fares, an excellent way of encouraging public transport use which continued to be overlooked. Employment centres along the way would have helped. Instead Strathfield and Hornsby are almost exclusively residential. Epping is destined to go the same way. The NBN is going to provide untold ways for changing the way and where whitecollar people work. I am not just talking about working from home, but in employment centres closer to where people live and reducing commute times and the need for expensive infrastructure investment. But you never see the issue discussed. You are absolutely correct, Ray. Additional evidence is the fact the Optus bus continues to run even after ECRL was opened. Nothing will change in Macquarie Park until the land is too expensive to be used for car parking. I can’t understand why Epping was not preferred for office accommodation. After all it has had a railway since 1886. Likewise for Eastwood, which is the largest District Centre on the Main Northern Line between Strathfield and Hornsby, but has sadly been ignored by successive State and Local Governments over the past couple of decades and is but a pale shadow of its former prominence. A review of the Town Centre Master Plan by Ryde Council is now in its seventh year. Just not good enough! However, there may be some light at the end of the tunnel for Eastwood (pardon the pun), with the Western Sydney Light Rail Plan proposed by Parramatta Council. This includes a link from Parramatta to Macquarie Park via Eastwood which is on the most direct route, utilising in part the Eastwood County Road reservation, which will effectively replace the Parramatta to Epping Rail Link at a greatly reduced cost. 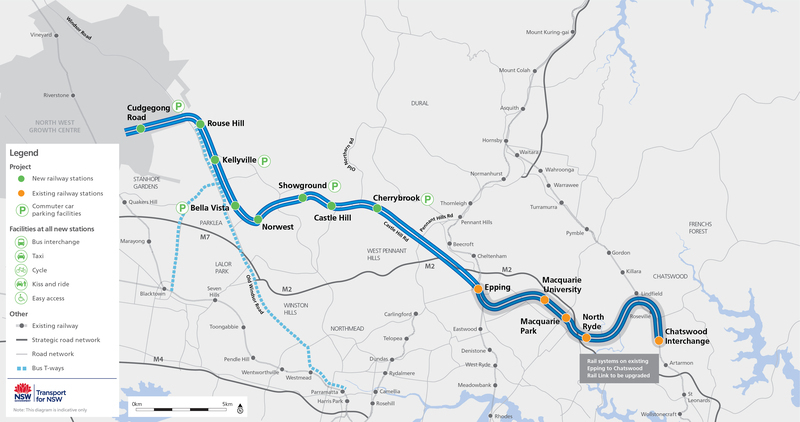 The State Government is currently assessing this proposal in consultation with Parramatta Council and there will be a favourable inclination to support it so that it is seen to be promoting development of transport links for Western Sydney. The dalays in delivery of the main line Waratah trains were absorbed by the Tangara trains being retained to continue carrying commuters with no loss of service. But once the Epping to Chatswood tunnel is taken out of use for conversion to the new single decker train types, no trains will be able to use that route until the new single decker trains are fully operational. This will cause major disruption to commuters during the conversion period even if the new trains work faultlessly first time. But any delays to the single deck train delivery will cause extended disruption. Clearly conversion of the Epping to Chatswood tunnel should be held up until the new trains are fully proven on the Rouse Hill to Epping track! But I doubt that will be enforced, and commuters could find themselves seriously disrupted for many months or even years. The oldest Tangaras are only 25 years old (the newest are 17 years old) and I doubt they will be retired before they turn 30. In fact, Cityrail held on to some Tulloch trailers until they were almost 40 years old. All 78 Waratahs will be operational in less than 12 months time from now, and has nothing to do with retaining Tangaras beyond their useful life (a point some won’t reach until 2030 or even later). Can anyone explain why it is necessary to rebuild the Epping Chatswood tunnel for single deck trains? Single deck and double deck trains happily operated on the same services for yeas till all the single deckers were gone. And remember that 10 trains operated with single deck motor cars and double deck trailers. It could be any number of reasons: changing the voltage, changing from overhead wire to third rail, lowering the height of the overhead wires to be the same height as the narrower tunnels, installing platform screen doors. Though I am speculating here. Also, no one has said how long the line will be shut for conversion. Days, weeks, months? It’s about segregating the services though. Not any of those reasons. There is no reason why the Epping to Chatswood Rail Link would need to be changed dramatically. It is unlikely that that the voltage would be changed from the current 1500v DC or even the existing signaling, which should be able to cope with 12 trains per hour. The only changes I can see is the installation of platform screen doors and perhaps automatic train control, which I imagine wouldn’t require shutting down the line, as they are already trialing this on the Cronulla Line. If they were contemplating changing the track gauge to make it incompatible with the rest of the CityRail network, then perhaps that might be another issue. Just as an aside, if the NWRL proceeds as planned, the connections to and from the northern line with the Epping underground platforms would become redundant as they would no longer be compatible with the Epping to Chatswood Rail Link. We need a north south rail connection here in the west. So many of my colleagues around Bankstown / Fairfield (where there is still some affordable housing ) & yet work at Macquarie park. They are forced to drive because the public transport connections are atrocious. What are the planners going to do about that? The north south connection in western Sydney is pretty much already there. All it really needs is for the Cumberland line to head north through Parramatta up towards castle hill via north rocks and Baulkham hills instead of being sent out along the western line. I have no problems with the nwrl being single deck as the line will provide 12tph vs the current 4tph for double decks on the ECRL and hence will still provide more seats over an hour then 4 DD trains. It will also provide the upper north shore with 4 extra services per hour. The 3 door solutions that the rer use are of a longer carriage design and of only 2.9 metres in width and hence offering only 2+2 seating and nowhere near the seating or standing capacity that waratahs can handle. The waratahs are actually quite good with the 8 carriage layout instead of the 2×4 carriage layout and offer faster dwell times then all other sets in the Sydney trains fleet (especially the s,k and c sets). They can carry more people due to the extra vestibules in carriages 4 and 5 and this makes a world of difference. The problems with our system invariably are to do with Town Hall and Central Stations. Wynyard is not bad at all as it has a lot of platform space. Central has recently benefited from the removal of the kiosk on platforms 18 and 19. This has created more space for people to stand on the platform and helped dwell times. Town Hall is really the bad apple and needs to be rubbed out and redrawn. There is not enough platform space on the upper 3 platforms due to the lifts and stairs required to get down to the lower platforms. This causes all sorts of issues with dwell time on platforms 1,2 and 3. I have witnessed the agony of a 5 minute dwell on platform number 2 in peak hour while people tried to get on and off a packed train and platform. I think the time has come for station skipping and/or empty train services to proceed to Town Hall to tackle the congestion issues. What is the point after all for a train to stop at a platform where nobody can get on or off. Just send it through if it is packed and get an empty car in to take the crowd at TH. This might allow an increase to 24tph and provide a short term solution before a new line being built through the cbd for the western line to connect to. Upper Northern line gets a frequency increase with the NWRL? I think you need to recheck your facts. They are actually being shafted, with services which will run to Sydney Terminal. In response to Craig, the north/south rail connection in Western Sydney is hardly already there. Sure, the Cumberland Line provides a connection between the south west and Parramatta, but the rail connection with the north west is non-existent. The cost to implement it would be massive. As an aside, the Parramatta City Council’s Western Sydney Light Rail Network proposal would be far more cost effective. With regard to your suggestion that 12 single deck trains per hour on the NWRL would provide more seating than 4 double deck trains per hour, you are correct. However, you conveniently forgot to mention that 12 double deck trains per hour could also be easily accommodated on the NWRL (dwell times are not an issue), which would provide double the amount of seating per train (and possibly more depending on the ratio of seating to standing passengers on the single deck trains). When you say that the single deck option for the NWRL would provide the “upper North Shore” with 4 extra services per hour, it is unclear whether you mean the upper North Shore Line or the upper Northern line. In the case of the North Shore Line, there are only 2 spare train paths available (bringing it to a maximum of 20) under the current timetable from Chatswood to the CBD. With regard to the Northern Line, any additional train paths via Strathfield, whether from Hornsby or Epping, would have to terminate at Central because of the lack of paths on the “suburban tracks” between Strathfield and the CBD. Your comparison with the Paris RER double deck trains is also not valid, because a Sydney 8 car double deck train with a nominal length of 160m compared with a Paris RER 10 car double deck train of 220m, even though narrower, is not an equitable comparison. In fact, a Sydney 8 car double deck train seats approximately 900 passengers against 1,100 passengers for a Paris RER 10 car double decker. Because of their greater length, the Paris RER trains have an overall crush capacity of seated and standing passengers of 2,500 against 1,750 for Sydney’s double deckers. However, one point which I will agree with you on, is that Town Hall is the problem with its limited platform space, particularly on platforms 1,2 &3 and this is the area which needs to be urgently addressed. As I recall Town Hall Station, there are on each level three tracks, with effectively two island platforms on each level. Unfortunately I cannot remember which platforms are numbered which, so to avoid confusion I will use letters. On the top level there are, from the west, the northbound North Shore on the western side (D) of an island platform, then the southbound North Shore on the western side (B) of the other platform, then the southbound line from Circular Quay on the eastern side (A) of the same platform. This arrangement ensures that all southbound trains on this level use the one island platform, with platform faces A and B. Town Hall station was constructed beneath George St, and there is a wide gap between the western edge of George St and the Town Hall and the Cathedral, both being set will back. This means that it would be possible to excavate on the western side of Town Hall Station to provide a new platform face (E) on the western side of the northbound track. At the same time the western island platform could be extended to close the gap with the southbound North Shore line, with a new platform face (C). This could enable the following arrangement. From the eastern side, on the one island platform, platform face A, southbound trains from the Quay and platform face B southbound trains from the North Shore. Then on the western island platform comes face C, also usable by trains from the North Shore, and face D for trains to the North Shore. Then face E, also for trains to the North Shore. E, departing passengers to the North Shore. This arrangements segregates, as far as possible, arriving and departing passengers and should do much to remove congestion on the platforms, hence reducing dwell time, as passengers would exit the train from one platform and enter the train from another platform. Low level platforms need not be altered, but it may be advisable to add the extra platform faces on this level while the upper level work is being done to avoid having to do the work separately in the future. Dudley, I am trying to get my head around what you are suggesting ( a few glasses of wine doesn’t help). The top level at Town Hall is platforms 1,2 & 3, numbered from east to west. The lower level is platforms 4,5 & 6, also numbered from east the west. Platforms 1 & 2 are an island platform (south bound) and platform 3 is a single platform (north bound). The reverse is the case on the lower level, with platform 4 being a single platform (south bound) and platforms 5 & 6 being the island platform (north bound). The general rule of thumb is that all station platform numbering starts from No. 1 in the Up direction towards Central and that includes through the city underground. From my interpretation, you are suggesting that 5 platforms should be constructed on the upper level of Town Hall (A,B,C,D & E). I can’t see how this would be feasible. At best, it may be possible to construct an additional platform on the upper level which would have to be a single platform opposite platform 3, but it would only be a relief line for the North Shore bound traffic. This is not necessarily a bad thing as platform 3 at Town Hall is the most congested platform on the Sydney Trains network because of the interchange to the North Shore Line from other lines. The bifurcation of the main western/north shore line at Town Hall would allow closer headways and avoid the problem of excessive dwell times. Look at Sydney Olympic Park where this arrangement exists as an example. I understand that this is a major factor in the success of the Zurich Suburban Rail system where inner city stations have bifurcation to dual platforms to allow for greater headways and less congestion. Having the North West line as a Metro system, unable to be connected to the rest of the system has been a decision made ignoring our rail history. Chatswood will be not unlike having to change trains at Albury in the past because the Victorian gauge was different. Haven’t we learnt anything.from history? We are “spoiling the ship for a ha’peth of tar” as the old saying goes. Yes and once done, will be hard to undo. I’m afraid it’s too late to change anything as contracts are now locked in. The only faint hope is that Labor will win the next election (probably unlikely) and call for a review of the whole project, notwithstanding the fact that compensation would be payable to existing contractors. IMO, looking to the long term future, the additional cost would be well worth it, as it would restore a policy of integrating the NWRL with the existing network, something which the current administration couldn’t care less about because of their obsession with privatising everything in the public sector. It will be interesting to see the government’s proposal and timeline for the conversion and cost of the Epping to Chatswood Rail Link to Metro operation, yet to be released. It’s a total waste of recourses in converting perfectly suitable transport infrastructure, only 5 years old, to an incompatible mode which will take decades to implement, if ever, across the broader Sydney network. The report provided by Jim makes for interesting reading. It is encouraging that the rail planners at least recognised the practical implications of the different scenarios for Sydney’s Rail Future, although their observations were totally ignored by the hierarchy only a month later when the 3-tier rail plan was announced (probably determined long before). It will be interesting to see how the new Director-General of Transport (who I think starts this month) reacts to the Rail Futures program. Being an outsider from Queensland, he may have a different critique to the outgoing Les Wielinga , who is part of the old regime. Might not be particularly good – his background is just like Les Wielinga. TMR in Qld is really just a road builder, that also looks after licences and rego. Only in the last couple of years has PT been brought back under its purview. The tunnels of the existing Paris metro are most certainly a typical metro diameter, while the RER has a much larger tunnel diameter, probably similar to the Syndey suburban. Also, the Paris metro is older than the RER, the first two lines dating back to 1900, with most other (completely new) lines being built within the following 35 years. The first RER line was opened in stages between 1969 and 1977, and there are now five RER lines, and one one completely new metro line (14) within the same time frame and only to aleviate RER line A. Most cities with metro type rail don’t have heavy suburban rail, and ones that do tend to have had metro first. So it probably doesn’t make sense to build a single deck metro in a metropolis with an already well established heavy suburban rail network. And double decker trains do work well with station appropriately spaced. And if the NWLR will have a constant turnover of passengers that the suburban lines don’t have, one might want to consider bringing the Metro Light rail into that area. Having worked in rail systems around the world, I find it bizarre that it’s only here where people think the term “heavy rail” is synonymous with “double deck”. It is not. I did actually write ‘heavy *suburban* rail’ not just ‘heavy rail’ to distinguish it from metro which *is* heavy rail too. We have *suburban* heavy rail in Melbourne with all single decker trains which. Of course Light Rail is not what’s being done, but I wonder if maybe light rail should be extended into the area as it may be better suited to a high turnover.